The architectural ensemble of the Kizhi Pogost is located on a narrow spit in the southern part of Kizhi Island, a small island of the Kizhi Archipelago in Lake Onega. The architectural ensemble includes two 18th-century wooden churches: the Church of the Transfiguration and the Church of the Intercession and an octagonal wooden bell tower built in 1862 and considerably reconstructed in 1874. The churches on Kizhi Island were mentioned for the first time in chronicles of the 16th century. They burned down after being struck by lightning in 1693 and the currently existing churches were built on the very site of the former ones. The ensemble bears evidence of the highly developed carpentry skills of the Russian people. Nowadays it is the only ensemble with two multi-domed wooden churches preserved in Russia. The Church of the Transfiguration is a monument with exceptional architectural and structural features. It has no parallel in either Russian or global wooden architecture. Considered by locals as the true wonder of the world, it gave birth to the legend about Master Nestor, who built the 37m high nail-less church using nothing but an axe. The Church of the Transfiguration was used during the summer, when the faithful journeyed from the outermost regions of the parish to attend services. A dendrochronogical study of the materials sets its construction date after 1713-14. The octagon, which defines the composition of the cruciform church, is extended by oblong bays facing the four cardinal points. The nave, flanked with side aisles, is preceded on the west by a projecting narthex reached via two staircases. The height of the Church of the Transfiguration, whose central cupola culminates at 37m, is a masterpiece of a multi-storey, multi-cupola, and single-block structure. Here, over a central volume covered with three octagonal frames, the architect placed bochkas (roofs whose peak is shaped like a horizontal cylinder with the upper surface extended into a pointed ridge) topped with 22 bulbous cupolas. Inside, under the so-called 'heaven' - a superb vault shaped like a truncated pyramid - there is a gilded wood iconostasis holding 102 icons from the 17th and 18th centuries. The Church of the Intercession, the Winter Church, refers to "ship type” churches and is a simpler structure. Built in 1764, it is of the “octagonal prism on a cube” type. Its elegant crown of eight cupolas is a unique element in Russian wooden architecture as this type of church was traditionally crowned with a tent roof. The eight cupolas encircle the 27m high central onion dome, and which covers the central parallelepiped space, gives it a more static appearance. To the east a five-sided small apse contains the altar. To the west is a long nave accessible by a single stairway. The 30 meters-high bell tower is of the traditional "octagon on cube" type with a high cube (2/3 of the structure height). The belfry crowns the structure. It has nine posts supporting the tent roof with an onion dome covered with shingles. The Kizhi Pogost is a unique monument of Russian wooden architecture, a universally recognized masterpiece of world architecture. It is noted for the harmony of its dimensions and shapes, and the artistic unity of its structures, built at different times. The architectural beauty of the ensemble is emphasized by the expressive landscape, which can be considered as a national landscape. 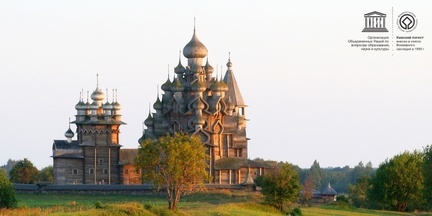 Criterion (i): Perceived by people of Karelia as "the true eighth wonder of the world", Kizhi Pogost is indeed a unique artistic achievement. Not only does it combine two multi-cupola churches and a bell tower within the same enclosure, but also these unusually designed, perfectly proportioned wooden structures are also in perfect harmony with the surrounding landscape. Criterion (iv): Among the five surviving pogosts in the extreme northwest of Russia, Kizhi Pogost offers an outstanding example of an architectural ensemble typical of medieval and post-medieval Orthodox settlements in sparsely populated regions, where missionaries had to cope with far-flung Christian communities and harsh climate. Accessible by land or water, the pogost clustered religious buildings, which could also be used for other occasional purposes; for example the spacious refectory was used as a meeting hall for the village community. Criterion (v): The Pogost and the buildings, which had been grouped together to form the museum site in the southern part of Kizhi, are exceptional examples of the traditional wooden architecture of Karelia and, more generally, of that of northern Russia and the Finnish-Scandinavian region. Russian carpenters, whose fame takes root from the Medieval Novgorod, had carried the art of carpentry to its apogee. Irreversible changes have caused this traditional skill to disappear. Hence, it is absolutely essential that ensembles like that of the Kizhi Pogost be preserved for their illustrative value in the history of ancient techniques and for what they tell us about old lifestyles. All attributes that convey the Outstanding Universal Value of the property are included within the boundaries of the property and have the adequate size to ensure the complete representation of features conveying its significance. The integrity of the architectural ensemble of the Kizhi Pogost, encircled by a wooden fence, has been largely maintained and is not threatened by contemporary development or neglect. Since ancient times, parish churches on Kizhi Island have been the centre of spiritual life of the region and a symbol of community for a large peasant world united by economic, social and family ties. It was therefore necessary that the church, the graveyard and the buildings needed for the far-flung communities' religious life be grouped together in one place. The Kizhi Pogost has dominated the holistic territory for many centuries. The structures are located in the form of a triangle, which creates the integrity of the ensemble. The structure of villages and the landscape, reflecting the system of traditional land management in peasant agriculture, undisturbed by modern building activity, have been preserved up to the present time. To maintain these conditions, developments in the vicinity of the property and its setting need to be controlled. The Kizhi Pogost is an illustration of a carpenter pushing a technique to its furthest limits. The traditional building techniques and the structural and decorative elements that have been used in Russian architecture for centuries are brilliantly and perfectly implemented in the ensemble structures. Throughout its 300 year history, the monuments have been periodically repaired. In the 19th century, the walls of the churches were covered with protective siding boards and painted white and the domes were covered with metal sheets. Restoration works in 1949-59 returned the churches to their previous original appearance. In 1980-83, a steel framework was installed in the interior of the Church of the Transfiguration and the iconostasis and interior elements were removed from the structure. In spite of these interventions, the structures have not been significantly reconstructed and have preserved a substantial part of the original elements and material. To maintain the conditions of authenticity, restoration criteria and guidelines are crucial to address the treatment of elements from different periods, of witness marks, among other issues. The Kizhi Pogost represents an important step in the establishment of Orthodoxy in the Russian North. The churches have been used for liturgical services since their construction, except during the Soviet period of 1937-1994. The Kizhi Pogost is a federal monument of history and culture protected in accordance with Federal Law No. 73 "On cultural heritage (monuments of history and culture) of the peoples of the Russian Federation, dated June 25, 2002. In 1993, by the Decree of the President of the Russian Federation, it was listed in the State Code of Most Valuable Objects of Cultural Heritage of the Peoples of the Russian Federation. The establishment of the buffer zone for the Kizhi Pogost represents a crucial step in preserving the visual integrity of the historic landscape and ensuring the integrity of the property and its setting. Much attention needs to be paid to establishing effective partnerships between authorities, businesses and communities, to the strategic protection of this historical landscape, to the promotion of the Kizhi Pogost as a cultural and historical destination. It is necessary to clearly identify specificities of valuable elements of the territory and establish legally permissible forms of their use. The “Management Plan for the World Heritage property Kizhi Pogost” is an essential tool to protect the Outstanding Universal Value of the property and to coordinate stakeholder activities. The day-to-day management of the Kizhi Pogost is the responsibility of the Kizhi State Open-Air Museum, which carries out monitoring, maintenance, and restoration of the Pogost monuments. As a particularly valuable object of cultural heritage, the fire emergency team and the special police unit guard the Kizhi Pogost. Maintaining the Outstanding Universal Value of the property requires understanding of the specificities of its natural and cultural environment and developing of appropriate guidance for the selection of restoration methods of monuments. The restoration of the Church of the Transfiguration, which aims to preserve the framework, the interior and the iconostasis, is a priority. The lessons learned in the process will be critical for addressing further specific conservation challenges.